Bush often appeared at events in his wheelchair wearing colorful socks designed to draw attention to favorite causes, including his wife's family literacy foundation. He is to be buried Thursday in a pair paying tribute to his service as a World War II naval aviator, according to Houston-based spokesman Jim McGrath. Among those gathered to meet Bush's casket at Houston's Ellington Field on Wednesday was Allison Spiers, 18. A West Texas native, Spiers described Bush as "welcoming" and humble, full of "Texas spirit and grit." Born long after Bush left office, Spiers never met the former president but spoke of him with familiarity, having attended classes at the Houston Christian High School center that bears his name. "His legacy lives on not only in his son, but in the people who go here and take leadership classes," Spiers said. With his body returned to Texas, it was to lie in public repose at St. Martin's Episcopal Church, which grew during the decades Bush and his family attended to become the largest Episcopal congregation in the nation with more than 9,000 members. A similar public viewing held at the church for his wife after she died in April at age 92 drew thousands. Mourners had been lining up since 9 a.m. to attend the viewing. Among the first was Pennie Werth-Bobian, a retired elementary school teacher from the Houston suburbs who first met Bush in the 1990s. A friend cutting the former president's hair at the Houstonian Hotel alerted Werth-Bobian, who stopped by and struck up a conversation. Bush asked that she return every month or so when he got his hair trimmed. The second time they met, Werth-Bobian, 56, asked what she should call him, thinking "Mr. President" sounded too formal. "'Call me George,'" she recalled him saying. "That's what he liked about me: that I talked to him like I talked to my dad," she said. "He said he and Barbara were best friends," she recalled. 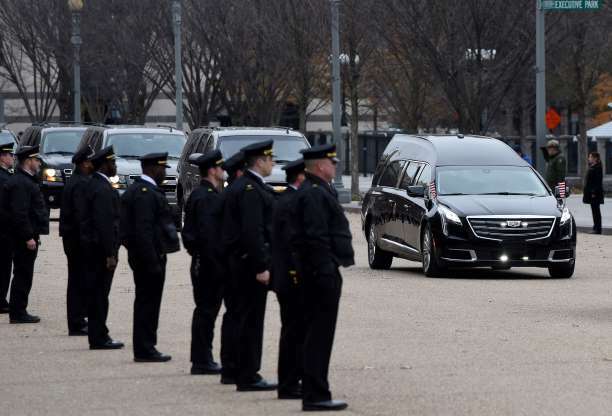 After the viewing and a service Thursday morning, Bush's remains will be taken by train and motorcade to the family plot on the grounds of his presidential library in College Station, including a ride up George H.W. Bush Drive. There he will be buried alongside his wife and daughter Robin. "It's the end of an era," Werth-Bobian said. "Houston has lost a great one." Please share to your friends and families. 1 Response to "Now it's Texas' time to bid farewell to George H.W. Bush "
yaa this farewell are very awesome and big.